Okwudili Nnagbo, a kidnap suspect fleeing to South Africa, arrested after boarding his escape aircraft to South Africa at the Murtala Muhammed Airport, Ikeja, last month was yesterday paraded at the headquarters of the State Anti-robbery Squad, Awka, Anambra State, alongside 13 other suspects caught for various offences. Nnagbo, from Nri in Anaocha Local Government Area of the state, said he had been in the business of kidnapping for many years, adding that he had lost count of the number of persons he had kidnapped in the past. He said he decided to quit kidnapping when one of his relations in South Africa invited him over, noting that he thought he had covered his tracks only to be arrested at the point of departing the country. 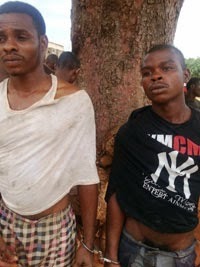 Also paraded were Chukwudi Chinedu from Okija, and Kevin Obi from Umuzu who allegedly raped the pregnant wife of a man they robbed of N66,000 and Uba Christian Chukwuemeka from Oji River in Enugu State who had been involved in the kidnap of female students of Nnamdi Azikiwe University, Awka where he enrolled for a diploma programme few years ago. Chinedu said he was living in Lagos and was looking for money to transport himself back to Lagos and blamed the devil for his action. 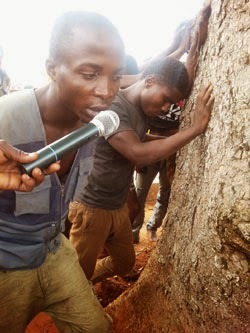 Another gang that includes Onyeka Ozoigbo, a vulcanizer, and Harrison Amaukwu, both from Uli in Ihiala Local Government Area were caught with 85 telephone handsets stolen from various people. 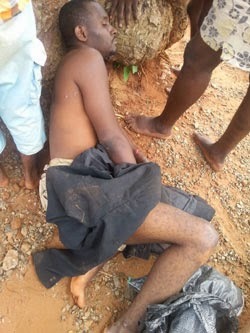 Luck, however, ran out on them when one of the people they approached to buy one of the phones at N1,700 alerted the Police and they were apprehended, while one member of the gang, who scaled the wall on sighting the police, is still at large. Another suspect, Mr. Chiagorom Ihejiagwa, from Akokwa in Imo State admitted that though he had a shop in Asaba, he was involved in buying stolen cars. The one that landed him into trouble, he said, was the Honda Pilot SUV which he bought at N1.5 million, adding that he knew that it was stolen before he bought it. The state Police Public Relations Officer, Mr. Emeka Chukwuemeka also displayed various arms and ammunition recovered from the suspects.